Inspired by Nigel Slater's "Dal and Pumpkin Soup", it's the perfectly soothing, aromatic lunch for a chilly day. Pictured here half-pureed, with some spinach leaves and a dollop of yogurt. In a large pot, heat the oil or ghee and stir in onion, garlic and ginger. Let cook over medium-high til softened and just light browned. Add spices and bay leaf, stirring in. Add lentils, squash and stock and stir over high heat til boiling. Spoon off any froth that rises to the surface. Lower heat to medium-low, cover, and simmer for 25 minutes. When squash is soft and lentils are fully cooked (about 20-25 minutes), remove bay leaf and puree the soup til silky smooth, or leave as-is (I pureed just a bit). Serve into soup bowls. Top with a dollop of plain yogurt, some sliced onions fried with garlic, fresh chopped cilantro, or stir in fresh baby spinach leaves -- or just keep it simple! Serves 4. Thnxs for those tips.Is it useful for our health?pls let me know.. Which tips are you referring to -- the recommendations for specific doshas, or the different toppings to add to the soup? For the doshas, absolutely following the advice for your mind-body type will help your overall health. If you want to know what your dosha is, go to my posted article "What Is Your Mind/Body Constitution" to find out (the first link under "posted ayurveda articles" in the long column on the left). Again thnxs for answering me and i will see that later. Yum, sweet potatoes and lentils! I'll try that too, Patty. Agnes, thanks so much for your comment, and I've created a guestbook thanks to your idea! Fran, I love your site! My Dosha is very Vata and this recipe is exactly what i needed tonight. You're beautiful. Be well. I was also finding problem while making the recipe but after looking your site my dosha has become perfect. Hi, Fran! I've been dropping in for awhile. 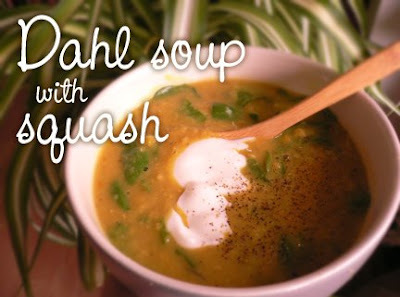 Just wanted to let you know I referenced your blog (in particular this squash dal soup recipe) in my backpacking blog this week about dahl for the trail. Thanks for all you do! The recipe sounds great and I love the photo. I am curious as to the onion and garlic in the recipe, as those ingredients are not very ayurvedic. I'd suggest a little hing in place of them! Read this article about Winter squash not being healthy in Ayurveda.